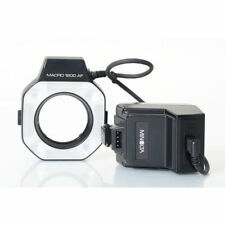 Minolta Maxxum 1200AF Ring Light/Macro Flash Complete Kit with Instructions Manual & other information. The unit runs on 4 AA batteries which are not included, nor is the instruction manual (though I'm fairly certain one can be downloaded online). ●Appearance of the item. [ Scratch ] - No. [ Dust ] -little. ・It works perfectry! Maybe we can find it for you. ● Functional Condition. 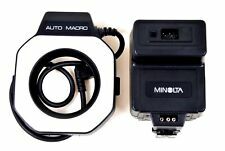 Minolta Maxxum 1200AF Ring Light/Macro Flash - Complete Kit - Excellent Cond. Includes 2 lens adaptor rings [55mm & 49mm(?). Case shows very slight scuffing on back. Batteries not included. ]. 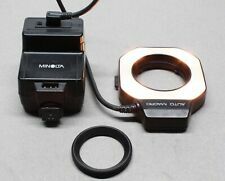 MINOLTA MACRO FLASH 1200AF SET(n). MINOLTA MACRO FLASH 1200AF. From Japan #408. Flash works properly. NEAR MINT IN BOX . ■ Grade :NEAR MINT. ■ Appearance :★★★★ ★. FS-100 Shoe Mount Adapter. Item condition has 8 levels, shown on the item titles, “New" - “Mint" - “Great" - “Good" - Normal (No Marks) - As-Is - for Repairs - for Parts. Case, Flash Adopter(FS-1100), 55mm Adopter Ring＜Batteries(LR4　x 4) are not bundled＞. ■ Appearance. Lighting Unit: 31001570. ■ Functional. Function:(Flash,Filmback,Neck strap,Hood,Front/Rear cap,Accessories, etc. ). It has light scratch on the apperance. If there is any problem which makes you want to open a case. I will look it for you. LESTER DINE/SUNPAK TTL MACRO RING & POINT FLASH. One of the best TTL Macro Flashes ever made. CONDITION: Excellent working. - Minolta X-series. - Point Flash - 28m. - Ring Flash - 14m. Guide Number (GN) for ISO/ASA100. We pride ourselves on providing hard to find parts at the lowest price. Exactly what is pictured is included. The reflector can be attached to the different lenses via adapter rings (S-52 and S-55). Buy It Now. WELCOME TO WOLF'S! (THIS ITEM IS BRAND NEW IN THE BOX!) MINOLTA 80PX AUTO ELECTROFLASH MACRO SET **MORE PHOTOS AND DETAILS ARE AVAILABLE UPON REQUEST. ** [Track Page Views With Auctiva's FREE Counter] (https://pages.ebay.com/seller-center/listing/listing-advanced-sellers/third-party-listing-tools.html#auctiva). In Nice Condition. Works perfect. The unit shows a crack on the flash ring, shows regular scratches/marks. Minolta flash anulare macro 1200AF con control Unit 1200 AF. Compatibile con reflex manual focus minolta e autofocus a pellicola prima serie (non Dynax). In einem guten Zustand, eingeschränkt funktionsfähig. Vereinzelt, leichte Gebrauchsspuren auf dem Gehäuse. Foto Zubehör. … a Minolta Macro Ring Lite Auto-Macro 80PX. Er kommt mit Tasche. Zwischenverkauf vorbehalten. Die Gewährleistung auf Gebrauchtware ist nach den gesetzlichen Regelungen auf ein Jahr begrenzt. Der Blitz befindet sich in sehr gutem Zustand.